Topics: Used Cars, Finance, Subaru, Isuzu, and Renault. It has 2 DNS records, ns2.blacknightsolutions.com, and ns.blacknightsolutions.com. 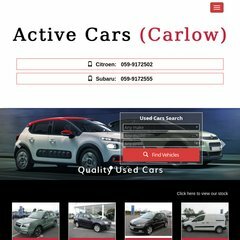 Activecars.ie's server IP number is 193.243.130.213. It is hosted by Trader Media Ltd Service Provision Network (England, Oxfordshire,) using Microsoft-IIS/6 web server. PING cname1.carzone.ie (193.243.130.213) 56(84) bytes of data.